Your sales numbers don’t have to hinge on some inferior product. Upgrade with the Hinge promotional USB drive, which is made of plastic with an aluminum insert on the pivot for a professional look that will last. Imprinting looks simply fantastic on the metal finish. 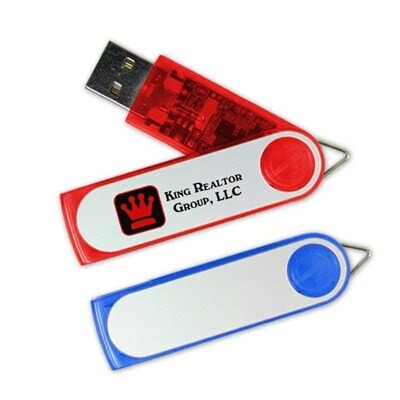 The cap-less branded flash drive can be imprinted by silkscreen or laser engraving. For a dynamic entrance into better sales, check out this fantastic option. Do things right the first time with the Hinge. Featuring a classic memory stick design and lots of customizable options that make promoting simple and stress free, this is a great method for expanding and adding to your marketing program. It offers several different case colors with a capless, swivel design meant to minimize physical storage space needed but retain ample data storage. Choose from silkscreen printing or laser engraving, whichever is best for your needs. You can pre load data onto the Hinge to send your potential customers home with more advertising materials.